At the last basketball game of 1956, Cosmo descended from a rope rigged in the Smith Fieldhouse rafters. 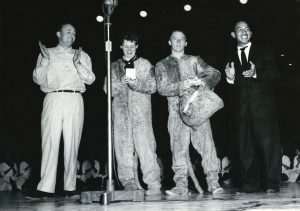 After performing with the Cougarettes, Cosmo’s “head” came off to reveal Peggy Herron (’56), the first female Cosmo, who had shared the role with M. Ray Pope (’56), both pictured, center. While Pope had more experience with gymnastics and walking on stilts, Herron (later Mortensen), Cougarettes commandant, knew all of the dance moves. Guarding Cosmo’s identity required creative costuming for Herron, who wore extra padding and shoes inside of shoes. She also practiced swaggering like a guy, coached by the first-ever Cosmo, Daniel T. Gallego (BS ’62), right.